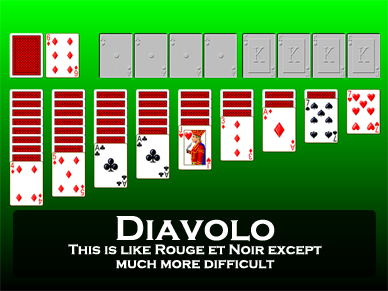 Screen shot of the game Diavolo from Pretty Good Solitaire. Diavolo is a very difficult 2 deck Spider type game. 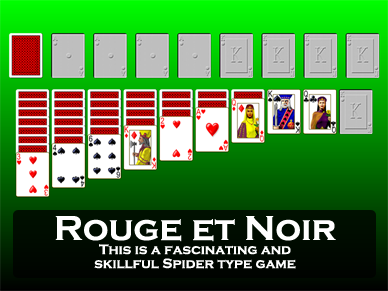 Diavolo is similar to the popular game Rouge et Noir and may actually be the game from which Rouge et Noir derives. Diavolo has a special way of building on the foundation piles. The leftmost 2 foundations begin with red Aces and are built up in color to Kings. The next 2 foundations begin with black Aces and are also built up in color. The rightmost 4 foundations, however, are not built up a card at a time at all. 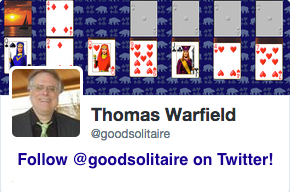 In these foundations, you must drop an entire 13-card sequence of cards. For the left 2 foundations, these sequences must be headed with a red King, the last two a black King. 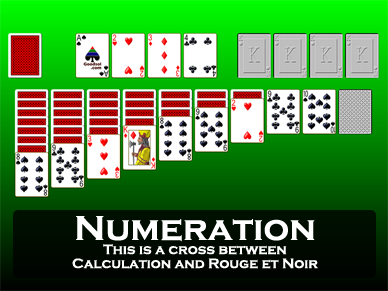 These sequences must be built in the tableau and transferred to the foundations as a 13 card sequence when they are completely built. There are 9 tableau piles. At the start of the game, 9 cards are dealt to the first pile, 8 cards to the 2nd, and so on down to one card to the last pile. Only the top card of each pile is face up. 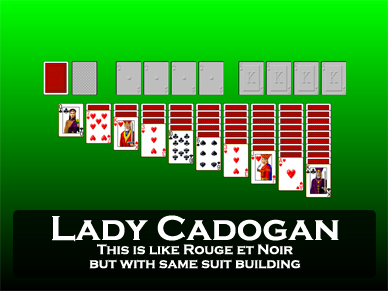 The tableau piles are built down by alternate color and groups of cards in sequence may be moved together. The remainder of the cards form the stock, which is turned over 1 card at a time to the waste pile. There are no redeals. Diavolo is an extremely difficult game to win. The expected winning percentage of a good player is unknown, but it probably very low. Usually the game ends when the stock pile runs out, and there are many cards left in the waste pile. To win, it is necessary to avoid having too many cards pile up in the waste, which means getting as many cards as possible into play. The big decision that you are often faced with in Diavolo is whether to play a card up to the first 4 foundations or to leave it in the tableau for further building. Often there is no good answer as to which is best. In general, whatever can get more cards out of the waste pile is probably the best move. 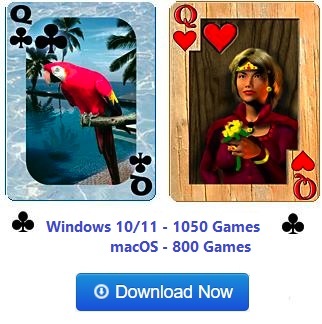 Diavolo is one of the 850 games in Pretty Good Solitaire.